The Weekly Treatment and 3 Month Treatment are different products and you only need one or the other. The Weekly Treatment is recommended for customers that use their tubs 4 or more times a week or have 4 or more people in the tub multiple times a week, or for customers that feel more comfortable adding the product once a week. I recommend the 3 Month product for people that use their tubs a few times a week with 2-3 people, or for vacation homes or customers that are out of town a lot. Reorder customers please check out the reorder kits page. New customers after reading the information below please look at the start up kits page and get a natural hot tub with The Natural Solution Weekly Hot Tub Water Treatment. Don't soak in hot tub chemicals like chlorine or bromine with the original all natural hot tub treatment. If you have any questions please don't hesitate to give us a call. Poor water quality is caused by contaminants such as body oils, lotions, urine, and other suspended solids. In fact, they’re the very things upon which unwanted bacteria feed, grow, and multiply. Thus, while hot tub sanitizers and hot tub chemicals kill bacteria, they do nothing to prevent their return. The all natural enzymes in The Natural Solution speed the digestion and removal of organic contaminants. This deprives bacteria of their primary food source, which inhibits their return, decreases algae growth, and simultaneously improves water quality and clarity. The Natural Solution For Hot Tubs also saves you time and money because it truly conditions water to help cleanse itself, meaning you’ll need less frequent applications of harsh hot tub chemicals or water clarifiers. The Natural Solution is an exciting advancement in water treatment. All of The Natural Solution products are non-toxic, easy to use, and economical. No more testing everyday or time consuming maintenance. The Natural Solution won't cause the rashes, itching, burning red eyes, and dry skin that hot tub chemicals do. With The Natural Hot Tub there is no nasty chemical odor and you won't feel like you need to take a shower after you get out of your spa, your skin will be soft and silky smooth after each use. Years of research, development, and testing by independent laboratories has produced The Natural Solution. A unique and powerful formula of enzymes specifically designed to keep your spa clean and healthy. The Natural Solution attracts oils and other contaminants, then dissolves them away, eliminating them without the use of harsh hot tub chemicals. The Natural Solution softens your water keeping minerals up along the water line eliminating the equivalent of "bathtub ring". Your water will be safer for you and feel better too! With hot tub chemicals or other treatment methods you need to test and treat your water constantly to keep the water free from dangerous contaminants, but there is a big problem with the way most hot tubs are treated, they use harsh spa chemicals. Many of the hot tub chemicals used to treat your water are toxic. The elevated temperatures of your spa cause these chemicals to be more active and an even greater threat to you. High hot tub temperatures open your pores and allow chemicals to be absorbed by your skin and blood stream. The chemical vapor caused by the temperatures of your water are breathed in, damaging sensitive lung tissue. No wonder 80% of people who use hot tubs have some kind of adverse reaction like red irritated eyes, itchy dry skin, rashes, and a burning feeling of the nose or lungs. With The Natural Solution you won't experience any of the symptoms and we GUARANTEE IT! 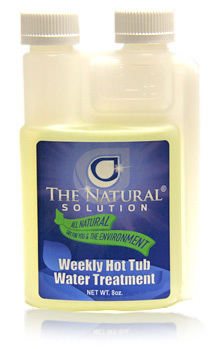 The Natural Solution for Hot Tubs is a easy once a week application that will keep your hot tub clean, clear and fresh. There are other products out there that claim you can go several months with no maintenance, this is just not the case. Applying The Natural Solution once a week keeps the enzymes working at 100% efficiency, unlike other products that loose their strength over time. Everybody who owns a hot tub is different, how often you use your hot tub, what you bring into the water on your bodies, and how often you clean your filters, are all factors that determine your maintenance routine. With our easy measure and pour bottle and a few steps of maintenance we describe in the directions, The Natural Solution's once a week treatment will drastically reduce your maintenance headaches. Remember everyone is different and what works for your friend or neighbor might not work for you. Over time you will learn and develop a routine that is right for you depending on you use your tub, and if you have any questions or need help with anything we are available, just give us a call. At The Natural Solution, we want to get you started right away towards getting clean, clear, and fresh hot tub water, and our Start Up Kits are the most convenient - and cost effective - solution. We especially recommend our Start Up Kits to new customers, they provide everything you need for a natural hot tub without the use of toxic hot tub chemicals. The Natural Solution recommends that you use the 7-TECH METAL STOP Carbon Prefilter to fill your tub, and any time you add water to your tub (even if it only a 1/4 inch of evaporation) it makes a huge difference. The prefilter will remove most all contaminants (bacteria, metals, minerals, water mold) out of your water. Starting with clean water from the Carbon Block Prefilter is important, especially with some of the things they are finding in our water these days. Using the prefilter will eliminate a lot of hot tub water problems right off the bat. Please read the Use Instructions, while you are on the site (go ahead and print them off) and if you have any questions please don't hesitate to give us a call, (1-360-610-7098). You can also call us directly to place an order over the phone with your credit or debit card, (1-360-610-7098).